Mark's blog page. : Timetable for the Royal Wedding on the 29th of April, 2011. Timetable for the Royal Wedding on the 29th of April, 2011. The Royal Wedding of Prince William & Catherine Middleton. Venue; Westminster Abbey, London, England, United Kingdom. 8.15am bst to 9.45am bst: Most of the guests will arrive. Members of Kate’s extended family and locals from her home village take their seats next to the couple’s friends from school and university. Celebrity guests including David and Victoria Beckham, Sir Elton John, will also arrive. 9.50am: The next group of guests will arrive, including Prime Minister David Cameron and wife Samantha, Foreign Secretary William Hague and wife, Labour Leader Ed Miliband and fiancee arrive. Politicians from all parties sit with leaders and foreign dignitaries who have gathered from Commonwealth countries. 10.15am: William and his best man Prince Harry take their places at the front of the abbey. 10.20am: Foreign royals start to file into the venue. These include Prince Felipe of Spain and wife Princess Letizia, the Sultan of Oman, the Sultan of Brunei, Prince Albert of Monaco with fiancee Charlene Wittstock, and Sheikha Mozah of Qatar. 10.27am: Kate’s mum Carole Middleton and her brother James are dropped off at the abbey. 10.30am: Junior British royals arrive including; Zara and Peter Phillips will take their seats. 10.40am: Major Royals arrive including; Prince Andrew, Princess Beatrice and Eugenie, Lady Louise Windsor, Prince Edward, wife Sophie, Princess Anne and husband Timothy Laurence. 10.45am: The Queen and Prince Philip, the last guests to arrive before the bridal party, take their seats. 10.51am: Kate and her father Michael Middleton leave Mayfair’s Goring Hotel with precisely nine minutes to get to the abbey. 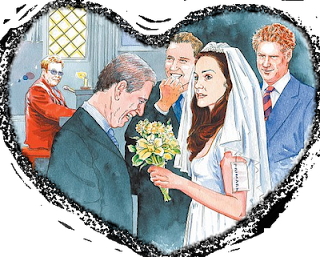 11am: Catherine arrives at the abbey to walk down the aisle on the arm of her father. The service then begins and is played on loud speakers along the procession route. 1.25pm: The balcony kiss. 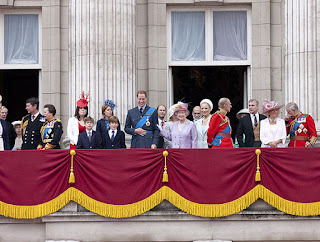 Catherine and William wave from the balcony at Buckingham Palace. 1.30pm: Wedding guests and the London crowds watch a fly-past by the RAF performing a Battle of Britain Memorial Flight. O' and don't forget it's also on the official royal web site at; http://www.officialroyalwedding2011.org/. Sky News: On and off all day with other news and advert breaks.